Eight-year-old Megan Steadman's immune system is like that of a newborn and needs a special treatment derived from blood plasma to strengthen it. Production of immunoglobulins was banned in the UK in the 90s over fears about the potential spread of the human version of "Mad cow disease". It has since been imported, but is now in short supply and there are calls by patient groups to overturn the ban. The UK government said it was working to address the supply issue. Large amounts of plasma are needed to make the treatment, which is used to treat people whose immune systems have failed. Megan is one of only 5,000 people in the UK with a rare condition called primary immune deficiency. She had a stem cell transplant last year, which her family hope will cure her condition, but for now her life depends on regular infusions of immunoglobulins. 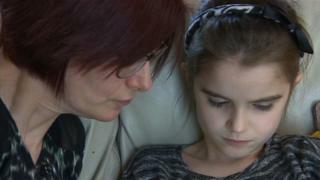 Her mother Victoria Stoneman, from Aberbargoed, Caerphilly county, said without the treatment Megan may not be able to fight infections. "This is to strengthen her new immune system, she's like a newborn baby at the moment, she's not ready to be immunised yet. "So the immunoglobulin treatment keeps her strong and healthy and able to fight infection." Megan added: "It makes me feel better." Ms Stoneman said she first noticed Megan's symptoms when she was two months old. "[She had] high temperatures that we couldn't bring down and lots of hospitalisation with severe ear infections. She often displayed symptoms of infection without infection. "She was diagnosed when she was 18 months and was put on immunoglobulin at two and a half." 'Mad cow disease': What is BSE? Immunoglobulins are extracted from plasma by a process called fractionation and it takes thousands of units of plasma, donated by a large group of people, to produce a single bottle. The process was banned in the UK in the late 1990s in the wake of the Mad cow disease - or BSE - crisis. Scientists were concerned just one blood donor carrying the human form of the fatal disease - variant Creutzfeldt-Jakob Disease (vCJD) - could theoretically infect a entire batch of immunoglobulins. Since then all supplies have been brought in from other countries. But new treatments have seen the global demand for immunoglobulins rocket. In Wales alone requests for immunoglobulin have increased by 35% since 2013, and there is now concern the situation is unsustainable in the long term. Liz Macartney, from the charity UKPIPS, which represents patients with primary immune deficiencies, said shortages were already impacting on patients. "In the past, immunologists would try and assess which product would be better for each patient," she said. "At the moment, we just have to accept whatever the NHS can buy. Potentially it could be devastating. "Pharmaceutical companies tell us they will continue to make sure there's enough immunoglobulin for all patients who have an immune deficiency, but in the long term we've got to make sure we can produce our own." Tommy Browne, from Barry, Vale of Glamorgan, is a spokesman for the Immune Deficiency Patient Group Wales and was diagnosed with a primary immune deficiency 11 years ago. He was recently told his medication was going to be altered. "It's a big thing to have it changed because they don't know how you are going to react to a new brand," he said. Should we pay people for donating blood? The UK government's Department of Health, which oversees the regulation of treatments, said they were working with NHS England and other partners to address the pressure on supply of immunoglobulin over the last 18 months. Chloe George, from the Welsh Blood Service, which manages the supply of immunoglobulins in Wales, said work was being done across the industry to increase supplies. "Manufacturers... are also looking at ways to innovate new technologies so they can get more grams of immunglobulin per every unit of plasma," she added.